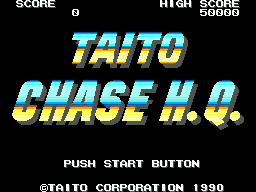 Chase H.Q., often known as Taito Chase H.Q. (タイトーチェイスＨ.Ｑ.) is an action-driving game developed by Taito. Originally released in arcades, it was ported to the Sega Master System and Sega Game Gear. Two sequels, Special Criminal Investigation and Chase H.Q. II were released for the Sega Master System and Sega Mega Drive, respectively. Players take control of two police detectives as they attempt to capture criminals who are fleeing the city with their high speed cars. After evading other cars and obstacles and finally reaching the target, players must cause enough damage to fugitive vehicle before the time limit to finish the stage. While attacking from behind also works, hitting from sides causes most damage. Turbo boosts can be used (limitedly, 3 in each stage) for short time maximum speed. A shop system exists in which players can purchase upgrades for their cars, for example bumpers to cause more damage, an extra turbo boost for the next stage, engine power-ups, and so on. The game restarts from beginning with more difficult targets after all five stages are completed. The Sega versions of Chase H.Q. are inspired by the original arcade version, but make a number of changes to gameplay (such as the addition of extra power-ups) and make huge cutbacks on graphical detail. Such changes likely make for a smoother experience on the Master System, but a less accurate one. The opposite case can be seen in Ocean Software's 8-bit home computer ports released around the same time (particularly the highly acclaimed Amstrad CPC and ZX Spectrum versions), which sacrifice speed in favour of visuals. Main article: Chase H.Q./Magazine articles. NEC Retro has more information related to Chase H.Q..